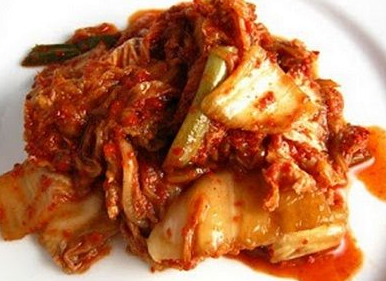 Recipes to Make Tasty Korean Kimichi and Practical -Korea, in addition to well-known to be a girl band and boybandnya beautiful and handsome: D, it also has a food menu that is well-known and much liked by many people in the world, namely kimchi. Hmm..mungkin many of you who are less familiar with the name of the food and do not know what the hell kimichi it ?. Kimchi is one of cypress traditional Korean food, which can be categorized as pickled vegetables which are fermented by the spicy flavor. Where in the treatment process, salted and washed, then mixed vegetables with seasoning made from krill shrimp, garlic, fish sauce, ginger and red chili powder. Usually general types of vegetables used in making the Korean traditional food is radish and chicory. Manufacturing process was not was not too difficult, and if you are the one that includes food connoisseurs kimichi from Korean and intending to know the recipe to make kimichi, then the following is a recipe how to make kimichi we have described briefly be easily understood and practiced at home you. The first step, dry mustard until clean sheet once to the most in mustard, without cut and leave it intact as it is. Then pour ½ cup of sea salt with water into a container, then soak the mustard in water solution for about 6 hours. After that wash more mustard to clean up to the deepest folds and if you want, cut, can be cut into two parts. Next, mix the sugar along with chili powder, ginger, onion onions, radish, fish sauce, chives and a little salt. All of the material is then smeared with mustard evenly on to the sidelines during the inmost while somewhat squeezed so that seasoning can seep into the mustard. Then place it in a sealed container, airtight and meetings (such as glass jars) and let stand for approximately two days, so that seasoning can permeate the sawinya. 0 Komentar Untuk "Recipes to Make Tasty Korean Kimichi and Practical"